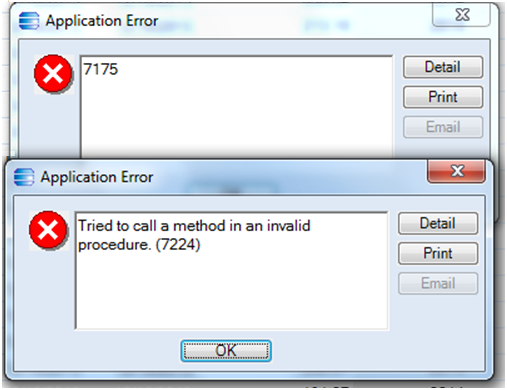 Several of our clients have experienced the infamous 7175 error and the subsequent “Tried to call a method in an invalid procedure. (7224)” error. This error normally indicates a broken network connection between the client machine and the server, so after a user sees this error, Epicor will stop functioning withal. For users with elusive but persistent network hiccups, this is especially aggravating. Users dread the infamous 7175/7224. Why does this happen? It happens because Client/Server systems are designed to require a stateful network connection. By contrast, the World Wide Web and thus Web applications operate on stateless connections. In less technical terms, this means that while you can pull your network cable or turn off your WiFi and come back to your web application, and it will still work fine, a Client/Server application must always have a solid network connection, so if that connection is broken — even momentarily — it must be renegotiated. While network problems are not our bailiwick, we do want to help folks use their ERP systems more efficiently. How should I deal with this? The sure-fire way to get back up and running is to close the Epicor client software and start over. This action, however, closes all open windows and clears all unsaved data. Therefore, before resorting to “…turning it off and back on again,” we advise that the user go back to the main menu and try “File >> Suspend” 1 and then “Resume.” In most cases, this will resolve the issue and the user will be able to continue working. This works because the Suspend/Resume command disconnects the client from the server and then reconnects it. Use suspend to gracefully restore the connection to the server. 1. Note that to enable “Suspend” for a user, the system administrator must go to the User Entry form and check the “Can Suspend” box.